As well as the Page menu (left) and the Site summary outline, there are two simple ways of finding people, places or particular topics of interest among the many pages of the 211 Squadron site. [Ctrl F] opens a small Find window, near the top of the screen. In the past, this form of search was reasonably effective in Bing and Google. For better or for worse, most other search pages are powered by one or the other of these behemoths. The usefulness of Google and Bing has fallen markedly in overall quality and scope in recent years. Google simple search results are increasingly clogged with irrelevance. More disappointingly, exact phrase searches have declined markedly in coverage and relevance in both engines, especially when combined with either the site: condition or the date option. Relative newcomer DuckDuckGo may be a worthwhile alternative. The results page now includes a date option. Searching an exact phrase (either alone or with the site:url condition) produces fair although not exhaustive results. Search on Fred Smith finds all the Freds, as well as all the Smiths. Either + or AND work in Bing and Duck Duck Go. Google removed their + option in late 2011 for crudely commercial reasons but AND still works. It may be two weeks or more after an update before results catch up in most Search engines. Sadly, malware can lurk anywhere these days. The best protection is to make sure your PC is always fully up-to-date, with automatic updates to your system, your browser and associated software, protected by appropriate privacy and security settings and regular scans with good, up-to-date anti-virus/anti-malware. The Stone of Remembrance at the Australian War Memorial, bedecked with floral tribute on a fine late Spring morning in Canberra, 90 years since the end of The Great War, that War To End All Wars. 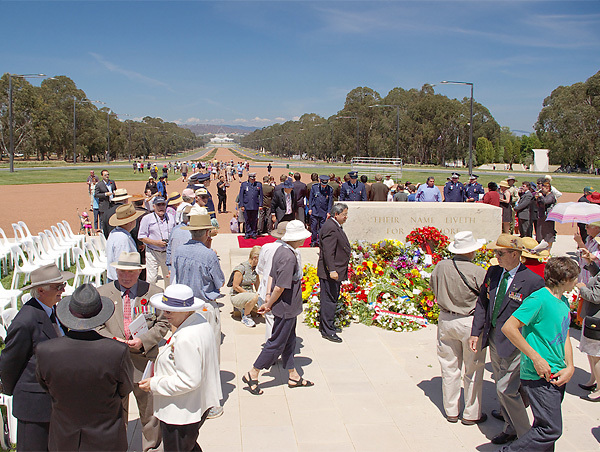 To the right, just beyond the parade ground, stands the distinctive shattered Doric column of the World War II memorial for Greece, first—or last—of the great avenue of memorials lining Anzac Parade. Far down the Avenue across distant, barely glimpsed, Lake Burley Griffin lie Australia’s old and new Parliament Houses, the long sweep of sites thus ordered with poignant significance. Sunday 11 November 2018 is the 100th Anniversary of the Armistice that ended the Great War. 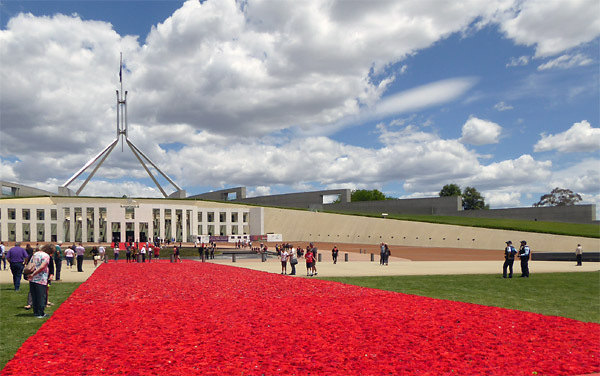 From Anzac Day 2018 onwards, tens of thousands of hand crafted poppies have been on show around the country to commemorate the centenary. In October, the collection reached Canberra, to be laid out as two great displays. 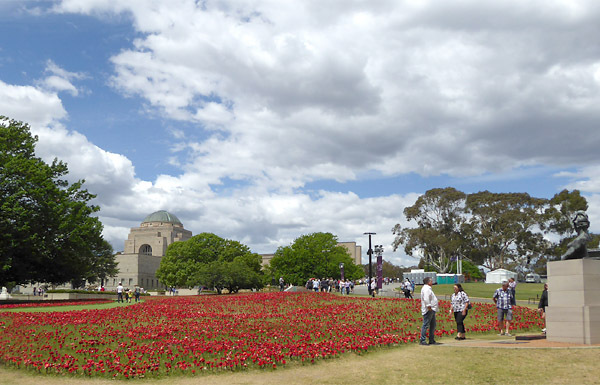 The other, a tide of 61,560 poppies across the lawns of the Australian War Memorial: one for each of the dead who had served in World War I. The true cost of war (the dead, the wounded, the ruin and all the grief) is no matter for glorification, then or now. The human condition is such that the horror of war, whether necessary or the result of sheer incompetence, may bring out not only the very worst but also the very best in ordinary men and women. So let us end as we began—with thanks, with hope, and with remembrance.